A stunning new view of Saturn's largest moon, Titan, captures beautiful layers of bluish-yellow haze in the moon's atmosphere. The image was taken by NASA's Cassini spacecraft on March 31, 2005. The photo shows individual layers of haze in the upper atmosphere of Titan — the second-largest moon in the solar system and the only moon known to have clouds and a dense atmosphere. 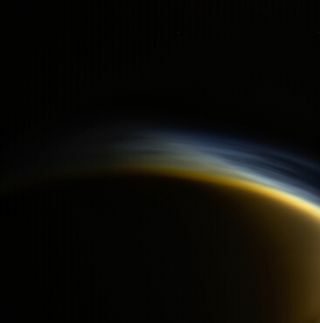 "Titan's atmosphere features a rich and complex chemistry originating from methane and nitrogen and evolving into complex molecules, eventually forming the smog that surrounds the moon," NASA officials wrote in a description of the photo, which was released last Tuesday (Jan. 16). The Cassini image was taken in visible light using the spacecraft's wide-angle camera. The photo was captured at a distance of 20,556 miles (33,083 kilometers) from Titan, according to NASA's description. "The view looks toward the north polar region on the moon's night side," NASA officials wrote. "Part of Titan’s sunlit crescent is visible at right." The Cassini mission — a collaboration involving NASA, the European Space Agency and the Italian Space Agency — launched in October 1997. The orbiter reached Saturn on June 30, 2004, and it delivered a lander called Huygens to the surface of Titan in January 2005. The mission came to an end on Sept. 15, 2017, when Cassini, which was running low on fuel, intentionally plunged into Saturn's atmosphere.